Welcome to another week of CASEing the Catty. This week we’re focusing on the Baby section. There were some very cute sample projects in the catalogue but I thought I’d feature Project Life by Stampin’ Up! Little Moments card collection. I actually don’t have the tangible cards as featured in the sample but rather have the digital version as that’s how I’ve found is the best way for me to keep up to date with my memory keeping. My first picture shows an (almost) exact copy of the catty sample (page 76 South Pacific catalogue) using the digital images. It was SO easy to create as there’s a template just waiting in My Digital Studio to use. It’s really as simple as dragging and dropping in photos, backgrounds and digi PL cards. There are even digital versions of the stamps and accessories they’ve used to jazz up the page a little. And colour matching is a cinch with digital design. This sample isn’t quite how I generally do my own Project Life pages, so I’ve created a second sample to show my own style. I’ve kept the photos the same and used the same template so that they’re easy to compare. Firstly, as a pre-Stampin’ Up! project lifer, I’m used to rounded corners so they’re the first thing to change. In My Digital Studio, rounding corners is as simple as right-clicking and selecting ’round corners’. You can choose which corners you want to round and the diameter of the ’roundness’ as well. I also tend not to use very many ‘word-y’ cards but I love plain background cards. Some of the designs in the collection are just SO cute. I couldn’t help but put the elephants in as well as some hip geometric patterns. You’ll notice that apart from one digi stamp, there’s no accessorising. Frankly I don’t have the time. I have 3 boys under 7, two jobs (one for the money and one for fun), am involved in school and kinder and there’s a husband that likes some attention occasionally as well. The important part for me is actually getting the photos in and I really don’t mind the simple style. Project Life is all about making memory keeping simple – and not putting pressure on yourself to have every page a masterpiece that took weeks to put together. The final touch for me is to insert some lines of stitching to break up the page and imitate the real life plastic pockets. I hope you’ve enjoyed seeing a couple of different designs but most of all I hope you’ve seen how simple and easy it can be to scrap your photos and still have great looking pages. 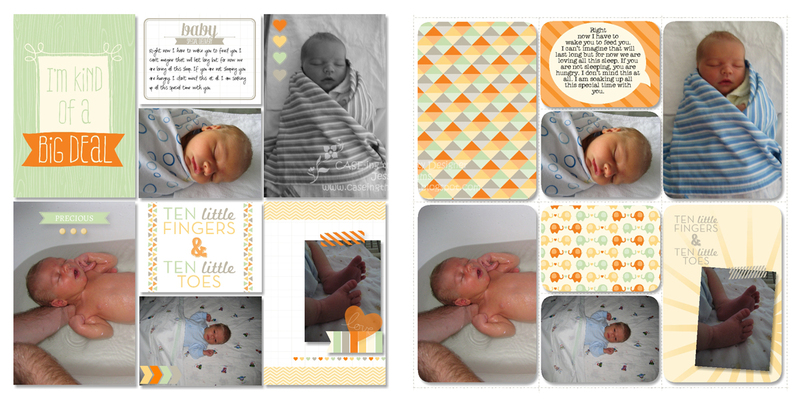 Visit http://www.caseingthecatty.blogspot.com.au to be inspired by other baby projects and have a play along with us too!